The Atlanta Braves head to Citi Field on Tuesday, September 26, 2017 to take on the New York Mets. The expected starting pitchers are R.A. Dickey for the Braves and Rafael Montero for the Mets. The odds for this matchup have Atlanta at -130 and New York at +120. The Braves have a 77-72-5 over/under mark and a 79-75-0 run line record. The Mets are 70-85-0 against the run line and have a 87-56-12 over/under record. The Braves have a 70-84 overall record this season. Starting pitcher R.A. Dickey has a 10-10 record with an earned run average of 4.32 and a WHIP of 1.39. He has 132 strikeouts over his 183.1 innings pitched and he's given up 188 hits. He allows 9.2 hits per 9 innings and he has a FIP of 4.75. The bullpen has an earned run average of 4.62 and they have given up 463 base hits on the year. Teams are hitting .240 against the bullpen and they've struck out 475 hitters and walked 212 batters. As a team, Atlanta allows 9.1 hits per nine innings while striking out 7.8 batters per nine innings. They are 24th in the league in team earned run average at 4.72. The Braves pitchers collectively have given up 1,385 base hits and 721 earned runs. They have allowed 185 home runs this season, ranking them 21st in the league. Atlanta as a pitching staff has walked 554 batters and struck out 1,196. They have walked 3.6 men per 9 innings while striking out 7.8 per 9. They have a team WHIP of 1.41 and their FIP as a unit is 4.51. As a team Atlanta is hitting .263, good for 6th in the league. The Braves hold a .414 team slugging percentage and an on-base percentage of .326, which is good for 16th in baseball. They rank 6th in MLB with 9.1 hits per game. Nick Markakis is hitting .274 with an on-base percentage of .354. He has 155 hits this season in 565 at bats with 72 runs batted in. He has a slugging percentage of .386 and an OPS+ of 96. Ender Inciarte is hitting .307 this year and he has an on-base percentage of .351. He has totaled 197 hits and he has driven in 56 men in 642 at bats. His OPS+ is 102 while his slugging percentage is at .413. The Braves have 1,399 base hits, including 275 doubles and 158 homers. 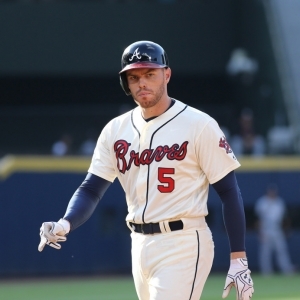 Atlanta has walked 445 times so far this year and they have struck out 1,132 times as a team. They have left 1,065 runners on base and have a team OPS of .740. They tally 4.55 runs per contest and have totaled 701 runs this year. New York has a 66-89 overall mark this year. With an earned run average of 5.30, Rafael Montero has a 5-11 record and a 1.72 WHIP. He has 108 strikeouts over the 110.1 innings he's pitched. He's also given up 129 hits. He allows 10.5 hits per nine innings and his FIP stands at 4.26. The bullpen has an earned run average of 4.76 and they have given up 545 base hits on the year. Teams are hitting .256 against the Mets bullpen. Their relievers have struck out 565 batters and walked 254 opposing hitters. As a team, New York allows 9.7 hits per nine innings while striking out 8.7 batters per nine innings. They are 28th in the league in team earned run average at 5.02. The Mets pitchers as a team have surrendered 1,474 base knocks and 765 earned runs this season. They have given up 212 home runs this year, which ranks 10th in Major League Baseball. New York as a staff has walked 568 hitters and struck out 1,320 batters. They give up a walk 3.7 times per 9 innings while they strike out 8.7 per 9. Their team WHIP is 1.49 while their FIP as a staff is 4.60. As a team, they are batting .251, good for 19th in the league. The Mets hold a .437 team slugging percentage and an on-base percentage of .320, which is good for 20th in baseball. They rank 18th in MLB with 8.6 hits per contest. Asdrubal Cabrera comes into this matchup batting .276 with an OBP of .351. He has 126 hits this year along with 53 RBI in 456 AB's. He maintains a slugging percentage of .430 with an OPS+ of 106. Jay Bruce is hitting .254 this season and he has an OBP of .322. He has collected 136 hits in 535 at bats while driving in 95 runs. He has an OPS+ of 114 and a slugging percentage of .507. The Mets as a team have 1,327 base knocks, including 276 doubles and 218 home runs. New York has walked 497 times this season and they have struck out 1,240 times. They have had 1,042 runners left on base and have an OPS of .757. They have scored 4.58 runs per contest and totaled 710 runs this season. Who will win tonight's Braves/Mets MLB game against the spread?